We had lots of fun celebrating Book Week and it’s theme ‘Escape to Everywhere’…The joy of reading is alive and well at St Martin’s! It was a wet and wintery Melbourne evening for our Story Night, but that didn’t stop nearly 400 parents and children from braving the weather to come to school for an evening of stories. The excitement was palpable as students arrived under cover of darkness dressed in their pyjamas, carrying cushions and cuddly toys, eager to listen to teachers read stories in cosy classrooms. A big thank you to families for coming along and to the 17 teachers who volunteered their time to read stories and ensure everyone moved safely to their story locations. 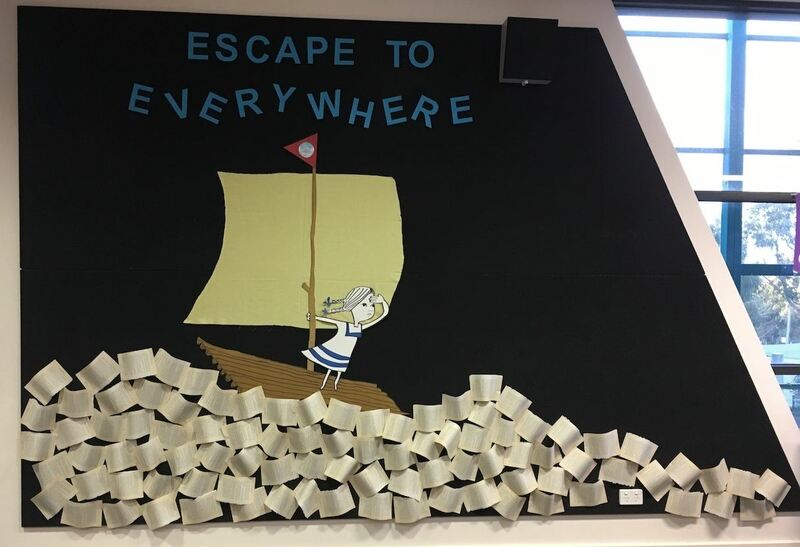 This year’s Book Week theme is Escape to Everywhere. Books are like escape hatches and portals that allow us to escape to places real and imaginary, backwards and forwards in time, to walk in other people’s shoes and provide us with experiences and we may never have in our real lives. Our library Book Week display was inspired by one of my favourite picture books A Child of Books by Oliver Jeffers and Sam Winston. Last week the Year 3-6 classes read this book and were captivated by the amazing images created using text from some of the classics of literature. We had some great conversations about where books can take us which we will be creatively exploring during our Book Week term in the library. Students were concerned about using real book pages in the display, but I explained our old smelly library book has been recycled or up-cycled and used creatively to represent a sea of stories, an ocean of adventures or whatever their imagination wants it to be…. Our Book Week celebrations include our Book Week Parade at 9.10am on Wednesday, August 23rd and then we can escape into some books when we return to school in the evening for our Escape to Everywhere Story Night (7-8pm). On Friday, August 25th the P-2 classes will have a morning visit from Anna Walker the winner of Book of the Year (Early Childhood) in 2016 for her picture book Mr Huff . Don’t forget to join in our annual Yeo-Low Medal Reading Challenge and our Creative Book Week Challenge – you will find posters about these in the library and around the school. We have a fun and creative term ahead celebrating reading and books! Where do your favourite stories take you? The highlight of Book Week was our Book Week Parade! This year our students were encouraged if possible to come as a character from a book written by an Australian author to celebrate the many Australian stories and book characters we enjoy reading. Our students, parents and staff never cease to amaze me with their creativity and it was a delight to see the many ingenious ways a multitude of book characters came to life on Top Yard on Friday morning. Thank you so much to everyone for embracing our Book Week Parade with such enthusiasm and joy! After our Book Week Parade our classes enjoyed a variety of literature and art activities focused on a Australian authors and books. A fun day was had by all! 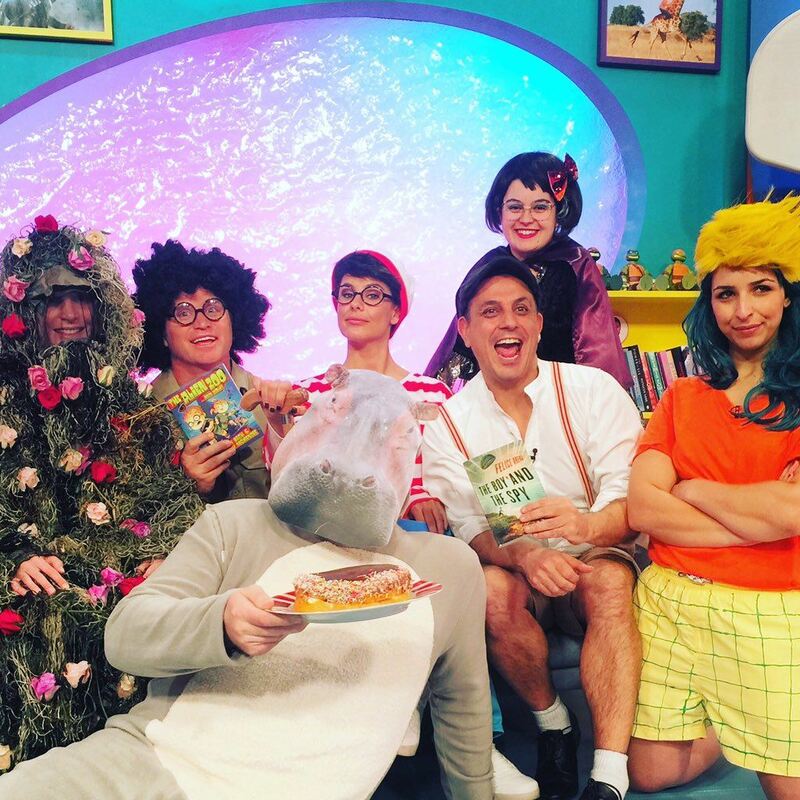 One of the ways students can participate in the fun of Book Week is by joining in our Book Week Creative Challenge. They are encouraged to unleash their imagination and creativity on the Book Week theme which this year was Books Light Up Our World. Do you have a favourite creation?